‘Race’ actress Sameera Reddy is four months pregnant with second child. It’s good news for Bollywood actress Sameera Reddy. Sameera, who made her film debut with the 2002 film ‘Maine Dil Tujhko Diya’ embrace motherhood for the second time in her life. Sameera revealed her pregnancy news at Lakme Fashion Week when she walked the red carpet flaunting her baby bump. 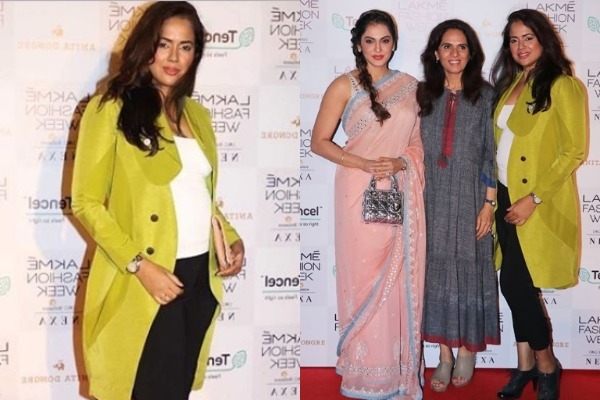 Soon to be mom Sameera made an appearance at the Lakme Fashion Week, wearing white top, layered with a green coat by Arjun Saluja, pants and not to mention, her cute baby bump! In an interview with an entertainment website, Sameera revealed that she is four months pregnant and due to deliver in July this year. “This is a planned baby. It is one of the reasons why I have refused quite a bit of work in recent past. My husband and I wanted to have the second baby in 2019”, she said. Sameera Reddy tied the knot to Akshai Varde, an entrepreneur on 21 January 2014. It was a traditional Maharashtrian wedding. They have three year old son named Hans. Sameera is also the first Indian actress to have her own video game, ‘Sameera the Street Fighter’. This mobile video game can be downloaded by millions of fans and is available to cell phone users throughout India. On the professional front, Reddy first appeared in singer Pankaj Udhas’s music video “Aur Aahista” in 1997. Sameera caught the attention for her pivotal role in the 2002 film ‘Maine Dil Tujhko Diya’. She also appeared in films like ‘No Entry’, ‘Taxi Number 9211’, ‘Race’, ‘One Two Three’, ‘De Dana Dan’ and others.